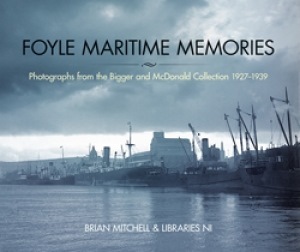 Foyle Maritime Memories; Photographs from the Bigger and McDonald Collection 1927-1939 is a new book from family and local historian Brian Mitchell MAGI. Brian is well-known as the manager of the Derry Genealogy Centre and author of several books including the indispensable A New Genealogical Atlas of Ireland. For his latest publication he has turned his attention to an archive of photographs, now in the care of Libraries NI, taken by the Derry Standard newspaper prior to WW2. He has researched a selection of these photos to explore Derry and Lough Foyle’s maritime history, particularly the themes of emigration, transatlantic tourism and the activities of the Londonderry Port and Harbour Commissioners. Images include the activity on the quays, loading and unloading of ships, tug-tenders plying between Derry and Moville, transatlantic liners, the Scotch Boat and emigrants and passengers on board the tenders, liners and cross-channel steamers. The 120-page paperback also captures the arrival of General Balbo and his ‘Italian Transatlantic Air Armada’ of 24 seaplanes on the Foyle in July 1933 on their way to Chicago’s World Fair and, in the year before, another transatlantic story that captured the world's imagination: the arrival in May 1923 of Amelia Earhart, the first women to fly the Atlantic solo, at Robert Gallagher’s farm at Ballyarnet. Priced at £9.99, the book is available from the publisher Colourpoint Books of Newtownabbey. ISBN 9781780731759.